Don’t take our word for it, read our reviews on Trip Advisor! 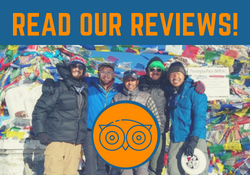 We’re super proud of our growing collection of client reviews that confirm we’re a highly recommended trekking company in Nepal. According to one of our clients, Krishna is ‘probably one of the best guides ever’! We think so too and we’re confident you won’t find better than Team Nepalorama. But don’t take our word for it – read our independent reviews on Trip Advisor! If you’ve trekked with us already, we’d love you to write a review! Your search is over – you’ve already found a highly recommended Trekking Company in Nepal! If you’re STILL not convinced, here are some of our favourite review snippets (you can read the full reviews on Trip Advisor). If you’re still not sure, find out more about us or why you should choose to trek with us. If you’re looking for older client reviews, have a dig in Krishna’s client review archives!